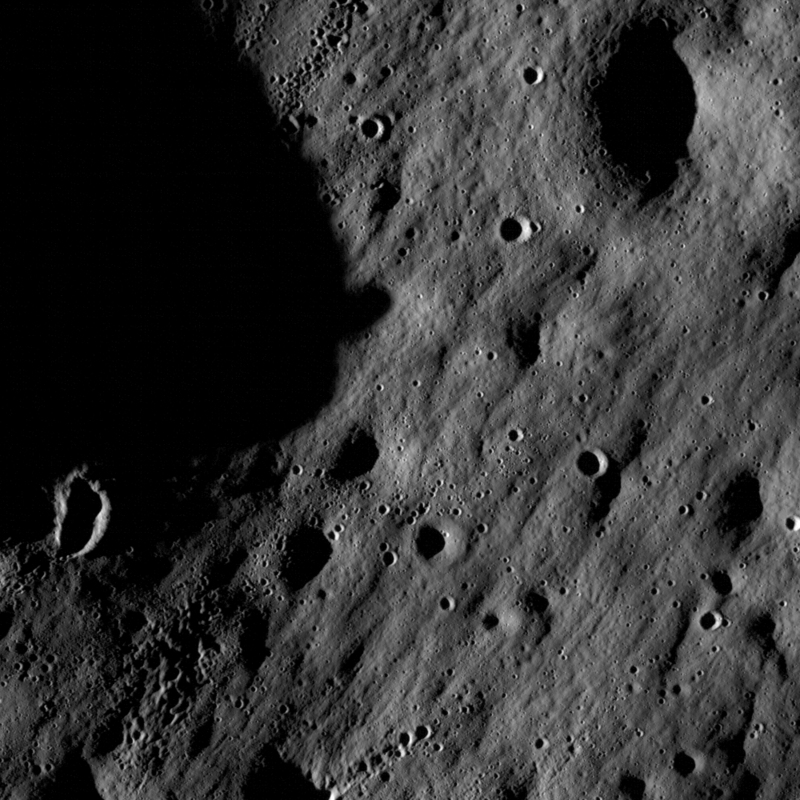 LRO First Light images of the Moon! 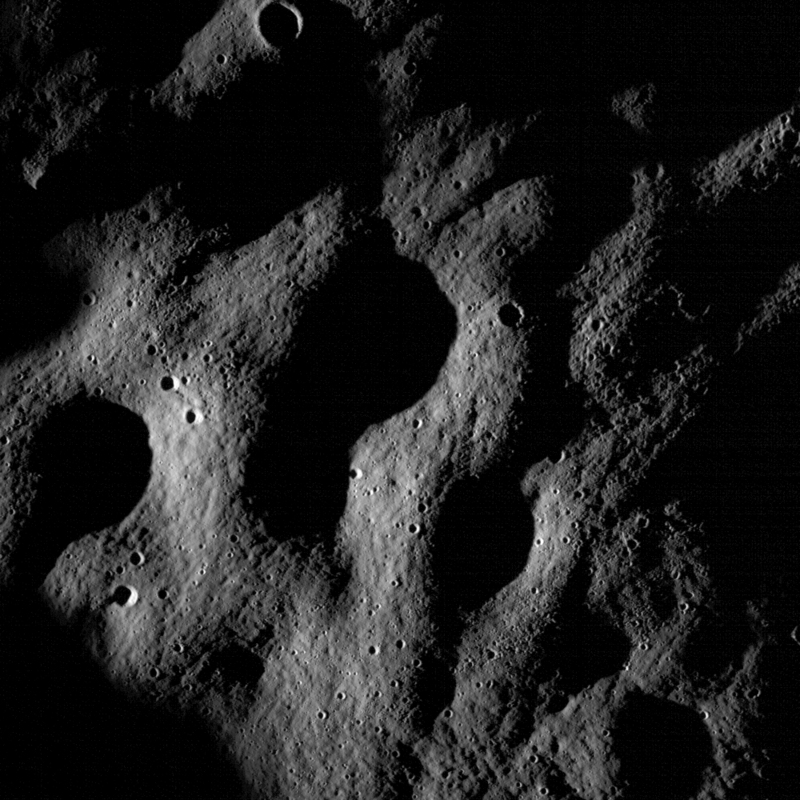 The Lunar Reconnaissance Orbiter has returned its first images from the Moon! Woohoo! This image, taken in the Mare Nubium region of the Moon, shows a heavily cratered area. The scale here is amazing: the whole image is 1400 meters across, or just under a mile. That’s like looking out your airplane window… if you were over the frakking Moon! Even in this compressed image (click to embiggen) features just a few meters across are distinguishable. See that perfectly circular crater just to the right and a tad below the middle of the picture? It’s about 60 meters across, just a bit bigger than two tennis courts end-to-end. It would easily fit in a football stadium. It’s a little difficult to interpret the image; for example, near the bottom in the middle I thought for a moment I saw a crater chain. I don’t think that’s real; our eyes tend to pick out linear features even when they aren’t there. Too bad, because that would be cool; crater chains form when an asteroid or comet breaks up before it hits, and we do see them on pretty much every cratered object in the solar system. You can also get them near a larger impact, when junk ejected from the crater splashes out and lands nearby. I guarantee we’ll see lots of such chains as LRO snaps more pictures. Awesome. This image has the same scale as the other, and shows a region of low hummocks undulating across the Moon. I don’t have much to say scientifically about this particular picture, but I will say that it is eerily beautiful, and completely enthralling. I wouldn’t mind having that framed over my desk! So there you go, folks. If you want to explore the Moon, all you have to do is sit back and wait for the images to roll in. And remember: when it settles into its final orbit, the pictures LRO takes will have a resolution of 0.5 meters, or 18 inches! Wow. I cannot wait to see more. P.S. If you liked this article, you might like this one as well where I dissect an image of the Moon taken from the space station.